One of the reasons we so strongly support local, community owned broadband networks over European-like regulations on private companies is that large institutions regularly game the rules. We wrote about this last year, when Free Press called on the FCC to stop Verizon from ignoring the rules it agreed to for using certain spectrum. Senator Franken, who has taken a strong interest in preserving the open Internet, has just reminded the FCC that creating rules does no one any good if it refuses to enforce them. Not only has Comcast announced that its own Netflix-like service does not count against its bandwidth caps, some researchers found evidence that Comcast was prioritizing its own content to be higher quality than rivals could deliver. Comcast has denied this charge and proving it is difficult. Who do you believe? After all, Comcast spent years lying to its own subscribers about the very existence of its bandwidth caps. The vast majority of the network neutrality debate centers around whether Comcast should be allowed to use its monopoly status as an onramp to the Internet dominate other markets, like delivering movies (as pioneered by Netflix). Comcast and many economists from Chicago say "Heck yes - they can do whatever they like." But the vast majority of us and the FCC have recognized that this is market-destroying behavior, not pro-market behavior. Susan Crawford on the importance of government policy. People who are concerned about the future of the Internet need to pay attention or the cable and telephone companies will take over the Internet (or at least access to it). Not because they are evil, but because what is best for them (or what they think is best for them in the short term) is not what is best for the rest of us or the vast majority of businesses that depend on access to the Internet. Local governments are often looking for low-risk options for expanding broadband access to residents and local businesses. There are not many. Seattle put some extra conduit in the ground as a part of a different project that was tearing up the streets but Comcast was the only provider interested. The problem with a haphazard program of putting conduit in the ground is that while it benefits existing providers, it does very little to help new entrants. And conduit is inherently limited -- only a few providers can benefit from it and when used up, there is no space for more providers. In short, more conduit may slightly improve the status quo but it does little to get us to a future where residents and local businesses have a variety of choices from service providers offering fast, reliable, and affordable access to the Internet. Smart conduit policy can lay the groundwork for lowering the cost of a community network, which can get us where we want to be. It may take time, but will create benefits far more rapidly than private providers will be building next-generation networks in most of our communities. John Brown, a friend from Albuquerque, New Mexico, has offered some tips for communities that want to develop smart conduit policies. Brown runs CityLink Telecommunications, an impressive privately owned, open access, FTTH network that connects residents, businesses, schools, muni buildings, etc. We tend not to support privately owned networks because for all the great work a companiy like CityLink Fiber does, one does not know who will own it in 5, 10, or 20 years. However, we recognize that CityLink Fiber is a far better partner for communities than the vast majority of companies in this space. The following comments are taken from an email he shared with me and is permitting me to republish. Direct quotes are indented and the rest is paraphrased. In truly competitive markets that display some degree of commodity-like characteristics, large and small vendors tend to coexist. I'm drinking coffee right now, which is a good example. Maybe Maxwell House and Folgers (and their parent companies) have a large share of the market, competing on price for their swill. But there is plenty of room for others to differentiate their product. Dunkin and Starbucks have built huge chains on their own style of semi-premium product, while another couple of niches of premium and superpremium beans are easy enough to find. Food markets tend to be like this; check out any Whole Foods (a/k/a The Museum of Modern Vegetables) for a supply of priced-above-commodity products. I feel foolish for selling most (not all, thankfully) of my Whole Foods stock when it was in the dumps a couple of years ago. The same thing happens in many fields. Apple itself sells computers above commodity price levels. There's a whole "high end" audio business catering to those who like to show off how much they can afford to spend. The automobile industry has mass-market commodity cars and several premium tiers. Internet access in the US lacks that because the natural monopoly on outside plant is not properly regulated. If it were treated here by EU norms, then any number of ISPs could access the wire. Some would just be cheap; some would offer premium help desks among their services. That doesn't happen, however, when the usual number of "competitors" is two. Even more so when those competitors agree that they should divide up markets between themselves rather than overbuild, or (heaven forbid) let outside information providers onto their facilities. The wire should be regulated. ISPs shouldn't. Amen. Physical connections are a natural monopoly. Even if the economics supported many physical providers, having so many would be terribly inefficient. Much better to have networks that are owned by the community and have independent service providers competing to deliver services -- just like the roads. One of the reasons community broadband networks face so many unique hurdles (often created deliberately by states in response to cable/dsl lobbying) is because of the many ways in which campaign finance corrupts our national and state governments. Community broadband networks are focused on meeting community needs, not sending lobbyist armies into Washington, DC, and state capitals (though one of things we do at the Institute for Local Self-Reliance is offer help to those that do push pro-community agendas in these areas). In short, many of the people who make decisions about telecommunications policy in DC have worked, will work, or are presently working for the massive companies that effectively control access to the Internet in most of America's communities. 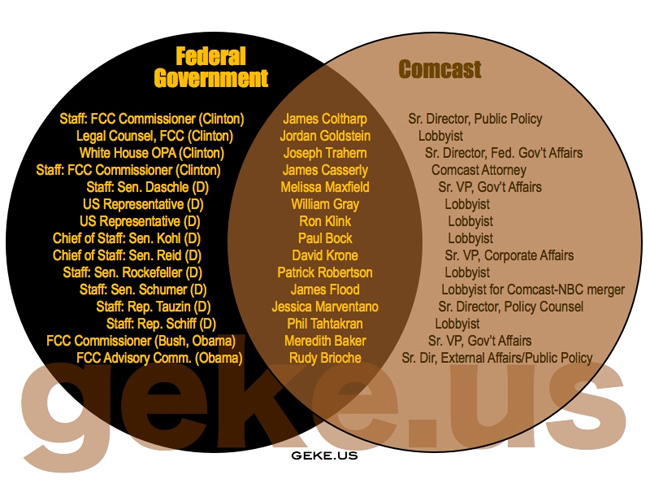 The good folks at Geke.US have created the following Comcast Venn Diagram illustrating a small piece of the DC revolving door. Reforming this system is a deep, seemingly intractable problem. But for those looking for answers, a good place to start is with the work of Lawrence Lessig. I just finished his Republic, Lost, which offers a grand tour of the problems resulting from the present system of campaign finance. You can also see a number of his presentations here. His organization, the Rootstrikers aim to get to the root of problems rather than being distracted by trying to fix symptoms of deeper problems. This is precisely what we do with our focus on community networks.